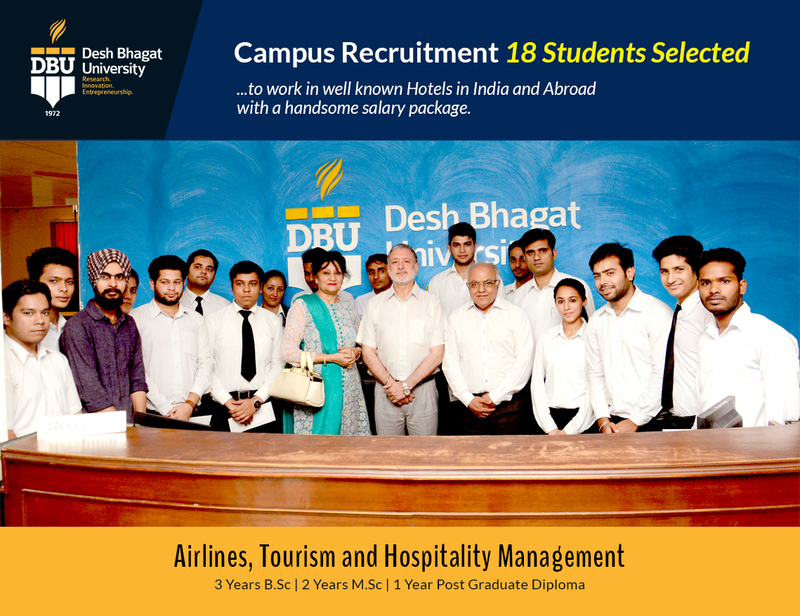 Desh Bhagat University Faculty of Hotel Management and Tourism among Top Hotel Management Institute In Punjab congratulates 18 students who have brought glory to the institution by getting selection in well known Hotels of India and Abroad with handsome salary package.Giving details about the selected students, Pro-Chancellor Dr. Tajinder Kaur informed that the university students has been selected for the job by reputed Hotels and Restaurants. She said that our student Sandeep Kaur has been selected by Cruise Line Company, that is famous for cruise travels, and she is posted in Australia at present. Other students who have been selected by hospitality/ hotel industry tycoons are as follows: Amar Taneja, Anand and Ankit Mishra has got jobs in The Raj Palace GKV Hotel, Jaipur, Anurodh Giri in Le Meridian-New Delhi, Dev Karan in Dunkin Donuts, Delhi, Hemant Kumar, Himanshu Sati, Naveen, Sadashiv Sharma and Sukhpreet Kaur inRegency Lagoon Resort, Rajkot (Gujrat), Kawaljeet Singh and Kanwalpreet Singh in Golden Tulip, Gurgaon, Amit Karkara, Rajesh Upadheya, Manish Upadheya and Vikas Kumar Mishra in Barbeque nation ,while Krishna Sanduja has got the job in Westin, Pune. For student wanting to study in the best university in Punjab and bag good jobs in blue chip companies, DBU has a very active training and placement department that ensures their professional aspirations are materialized. These students were selected through Campus Placement drive and Direct interviews by Hotels which was held at the university. The selection process consisted of online test, followed by group discussion and personal interview. After rigorous rounds of selection, these students got selected on different posts for different locations after handing over their appointment letters immediately after selection.While congratulating selected students, university Chancellor Dr. Zora Singh and Vice Chancellor Dr. Virinder Singh said that they are proud of them and encouraged the students to work with full dedication. They also appreciated the staff for their dedication and commitment to duty. Director Amit Sachdeva and Vice-Principal Parveen Goswami also congratulated the selected students and said that it is the result of the able guidance and hard work done by the students , teachers as well as Training and Placement Department of the university. The students who were in a jubilant mood gave the entire credit for their success to the highly committed teachers, state-of-the-art infrastructure and congenial academic environment in the university. 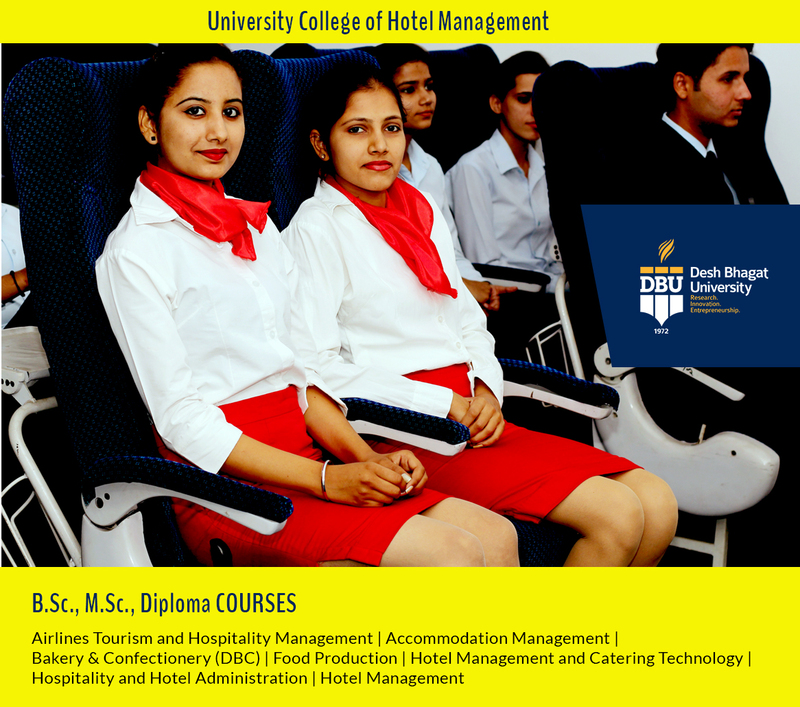 It merits mention that the university has tie-ups with reputed national and international companies and organisations to ensure best training and placement prospects for its students.Desh Bhagat University, best hotel management and tourism college in Punjab is trusted among students for its highly sought after courses in B.Sc Airlines Tourism and Hospitality Management, B.Sc Hotel Management and Catering Technology, B.Sc Hotel Management, Diploma in Food Production and Diploma Bakery and Confectionery.